DALLAS, Texas — The barbaric Islamic group ISIS, which identifies itself as the Islamic State of Iraq and Syria, has claimed responsibility for Sunday night’s attack on the “Muhammad Art Exhibit and Cartoon Contest” in Texas. The group put out a statement on Al Bayan radio on Tuesday, declaring that “two soldiers of the caliphate” had struck the event in Garland, and threatening worse violence upon the nation. As previously reported, the incident occurred on Sunday evening just as the exhibit and contest was coming to a conclusion. The event was organized by the New York-based American Freedom Initiative, led by Pamela Geller, who identifies as Jewish and regularly speaks against Islam. She has become known in recent years for her legal battles to place advertisements decrying Islam and exposing violent texts in the Koran in subways and other transportation systems. Geller was one of the speakers at Sunday’s event, as well as Dutch politician Geert Wilders, who is stated to be on an al-Qaeda hit list. Approximately 200 people were attending the exhibit and contest, which displayed submissions from across the nation depicting the Islamic prophet Muhammad. The winner was to receive $10,000. Geller had obtained security for the event, and metal detectors were used to screen ticket holders. Only those who had tickets were allowed to enter the exhibit and contest. 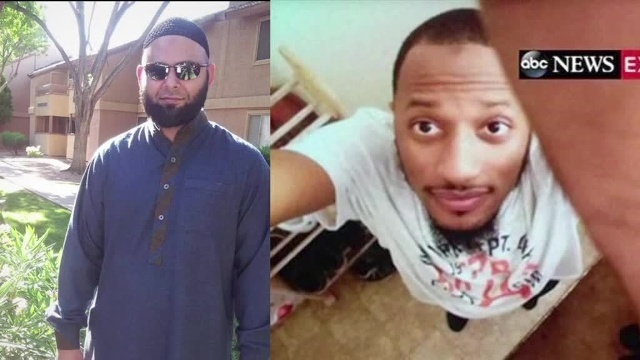 At approximately 7:00 p.m. local time, two men, who have been identified as Elton Simpson and roommate Nadir Soofi of Arizona, drove up to the Curtis Culwell Center in Garland and began shooting at a security officer. Police officers who were on duty for extra security then returned the gunfire with the suspects, fatally wounding them. Simpson, who had previously been investigated on terror suspicions, is believed to be behind the social media warning that was published just 15 minutes before the shooting took place. According to ABC News, ISIS sympathizers had been calling for attacks on the event for the past week, pointing to the Charlie Hebdo shootings in France, and urging the U.S. “brothers” to likewise. However, while ISIS has claimed responsibility for the violence on Sunday, some believe that Simpson and Soofi were lone gunmen who acted on their own will without personal direction from the Islamic group. “They may not have had formal contact [with ISIS]. They may have had email communication or read communications from ISIS, but I don’t think they were directed by ISIS,” former FBI agent Clemente told CNN.